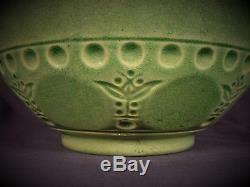 This is a very rare and magnificent early 1900s bowl. 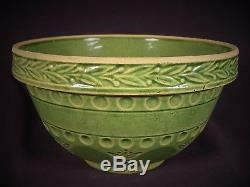 These bowls seldom come on the market and are among the rarest of the bowl patterns. 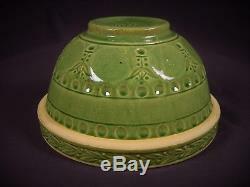 The shoulder has a band of molded laurel leaves and berries. 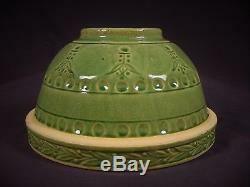 The side has molded dimples and moons with stylized flowers around the base. 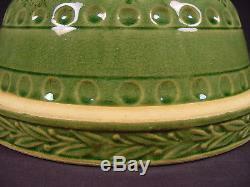 The green glaze highlights this attractive pattern. 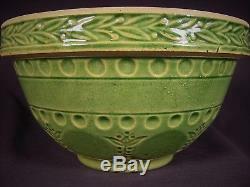 Measuring 9 ¾ in diameter by 5 ½ in height the bowl is in original mint condition with no damage or repairs. 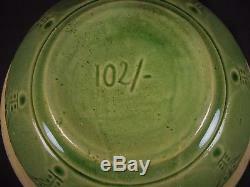 The base is marked 102/-, this is a production number used by Robinson Ransbottom Pottery Company who started production in Roseville, Ohio in 1910. 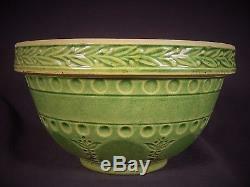 This ornate bowl was difficult to produce and was only made for a short period of time in a small quantity. 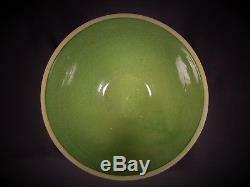 This is a very rare and sought after bowl any collector would be pleased to own. 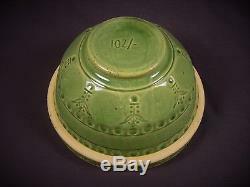 The item "VERY RARE LARGE 9 ¾ INCH GREEN GLAZE ORNATE RRP BOWL YELLOW WARE MINT" is in sale since Tuesday, July 17, 2018. 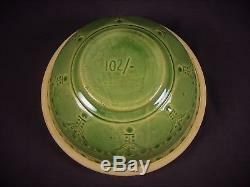 This item is in the category "Pottery & Glass\Pottery & China\China & Dinnerware\Stoneware".fever" and is located in Sterling, Virginia. This item can be shipped to United States.